Hi Miss Susan…..my Mom worries that I’ll fall asleep there and roll down the stairs but I usually keep at least one nail hooked into the carpet for safety’s sake!!! HAHAHAHA My version of wearing a safety belt. HAPPY SUNDAY! Mom manages to step OVER me, but I suppose that’s a bit dangerous for her…..there’s just something about stretching out on a nice, comfy carpeted stair in the sunshine that I can’t resist!!!!!! Hi Mollie! The BBQ was grand but you know all about those since your Dad does a lot of cooking out (and you do a lot of stealing of whatever he’s cooking!!!). Anyway, they loved their ribs and “fixings” and I kept them company with a dish of tuna. Mom let me try a bit of BBQ sauce but I just made a face, shook my head and said THANX but NO THANX!!!! You must have been working hard to make yourself so tired, Sammy. Ditto, S. I’m ready for a nap! zzzzzzzzzzzzzzzz……oops……….’scuze me – I drifted off a bit! It’s a snoozy Sunday……have a nice nap Cupcake! You boys are going to have to keep your Mum in “chill mode” so she can finally get over that persistent cold of hers…..lying on her legs or lap and keeping her STILL is a good job for the three of you! And with that beautiful new garden (and hopefully some sun and good weather) maybe you can get her to REST UP! Ginger ninja: ooooh, that’s a cool nickname! Happy Sunday from your girl Sundae. Hi Sundae! Whatcha doing today? Snoopervising your Mom in the garden? Keeping an eye on Motor Man so he stays out of trouble? Watching the birds, deer, geese and swans from your window seat? Hope you have a lovely Sunday whatever you do. Hi Charlie! Rain – indeed it’s not the kind of weather we kitties like to be out in. However, rainy days are purrrrfect for naps. I hope you’re getting a bunch of those today Charlie. We expect rain here later so you know I’ll be doing the same as you!!!! Hope the ginger ninja ‘trap’ doesn’t get stepped on! Hi Miss June! Well I keep one eye open at all times so as to avoid those BIG FEET of humans! I know I shouldn’t be on the stairs like that because I’m in the line of fire (!!) but I can’t resist sun – WHEREVER it is! Happy Sunday. Hi Goose! I’m glad you like my “Master of the Stairs” shot….hee hee! That looks like a great spot Sammy. Have a great Sunday. Indeed – I think it’s great but Mom and Dad “not so much” since I’m somewhat of a stairway roadblock! Oh well….they can just wait until I get up to go get a snack right???!!! Ahhhhh yes! I like the way you think Miss Layla! Yous loks so furry cute on the stairs lying in that sun puddle! Me is so looking forward to a easy Sunday, if mes can keeps Mommy from doing anything! Follow her round and meoooooooyowwww pitifully – she’ll sit down to sooth you, you hop up on her lap and insert claws in available flesh and voila – she’ll STAY with you!!!! See? 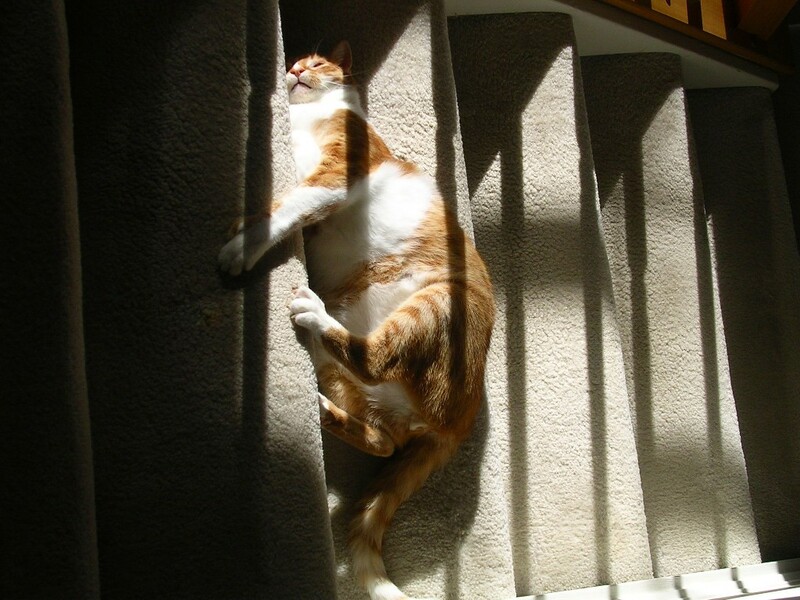 Our stairs get some of the best sun puddles too! Funny how it works out that way…..the most awkward spots are where the sun likes to park! Seriously, though… I sure do hope you’ll come visit me on Nerissa’s Life, today. There’s a special little somethin’ waitin’ for you over there. Oh dearie me……I better go get my big behind over there RIGHT now! I’ve been napping away the day – shame on me! Well Gizmo I thought it was purrrrfect but my parents thought it was a bit awkward trying to step over me without breaking their necks……boy oh boy – there’s no pleasing humans sometimes! Will we have to start calling you a “stair hog” Sammy? It seems like every time you post a picture of you on the stairs, you keep making me think your a “stair hog”, not that its a bad thing. I think your picture for today on the stairs is funny and cute. Back to the “stair hog” thing, it’s okay, I like to be one at times too! I hope you and your mom and dad have a great day, and sorry that I didn’t post earlier. I love stairs – I don’t fly up and down them as much as I used to when I was younger but they make GREAT lounge chairs! Ha ha. I bet they do make great lounge chairs, or stairs! Doesn’t it ever bug your parents if your in the way and they want to go up or down the stairs? Our cat Poka, as you may have already heard about before in some comments, she doesn’t sit on stairs, but since she’s gotten older, she’s been doing noisy “weird” meows, and sometime back then, she just started to come out to the kitchen and start looking for crumbs on the floor that we may have dropped. She’s a good cat like you Sammy! ooooh GUEST TEaser! We can hardly wait! Oooh! How exciting! I hope I don’t forget! That is one awesome sunpuddle you found there, Sammy. So I am sure you had leftovers!!! Please step OVER the Sam Cat! No bib picture but have a picture. Or two 🙂 It was a crazy day but FUN! Hi Miss Pix! I’m glad you had a fun day with THE MAMA and everybody yesterday…….glad you got a photo or two though! As for me – I really didn’t like that BBQ stuff BUT Mom gave me my very own can of albacore tuna (the GOOD stuff) so I had a treat too! Sammy your Mom will be the first one to get a bib picture when I get it and I will shoot her a picture of the Wes Man today 🙂 Lucky you with your tuna Sammy! Ima thinking you would have liked a teeny bit of cream that we had on our strawberries! Oh I certainly would have liked that! Sometimes when Mom has whipped cream on something I get a taste and that’s yum….I’ve never had REAL cream though – milk yes/cream nope! What a fantastic shot! I love this. Sammy, you just gave me a much needed smile. I’m so behind Sammy! But trying to catch up now. Take it easy Misaki…….we’re not going anywhere! We’ll always be here whenever you stop by! Looks like a comfortable place!